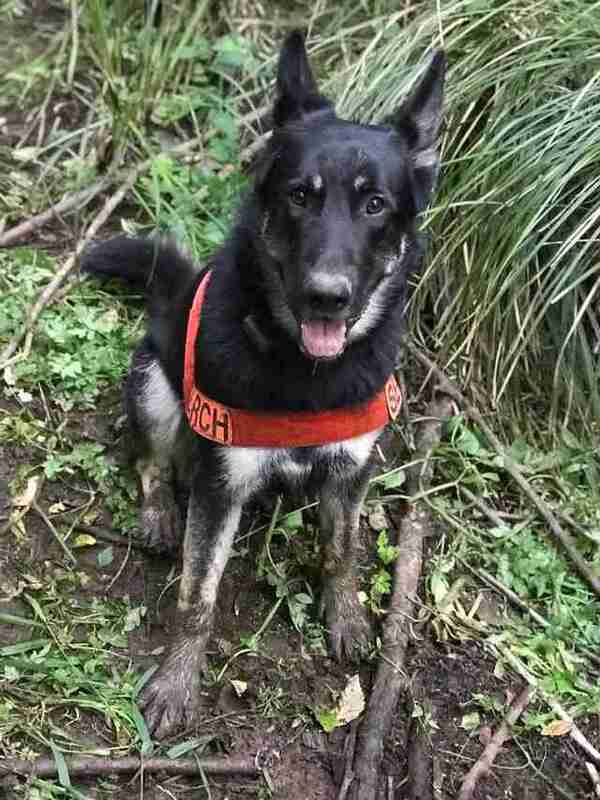 Two years ago, a very pregnant German shepherd was found wandering the woods of Washington state all alone. 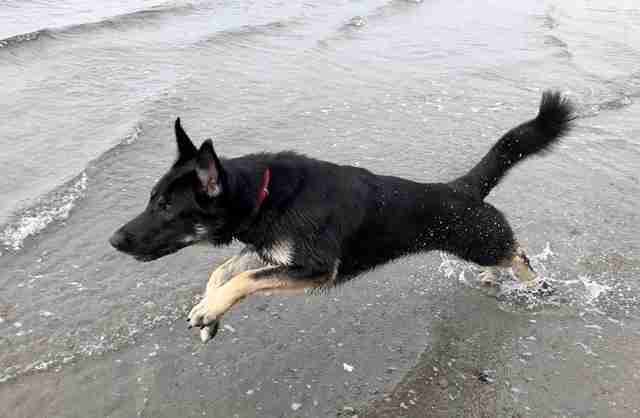 Jim Branson, founder of Useless Bay Sanctuary, a nonprofit dog rescue, took in the lost dog. 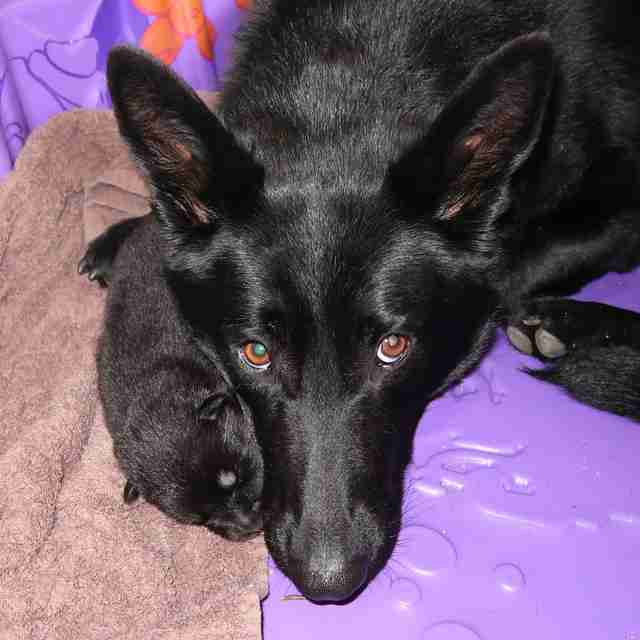 The very next day she gave birth to a puppy about "the size of a burrito," who was named Tino. The little puppy didn’t know it at the time, but one day he would return to the woods — this time to rescue another lost dog in need. As Tino grew, he started accompanying other dogs to search and rescue training classes, and soon Branson realized he had a knack for it. Branson adopted Tino, and after 16 months of training, he became a full-fledged member of Three Retrievers Lost Pet Rescue. So when Branson received the call that a deaf 11-year-old Great Pyrenees named Puppy had gone missing, he knew the perfect dog for the job. On Thursday afternoon, Puppy’s owner had gone for a horseback ride in the woods and, true to his youthful name, Puppy eagerly decided to tag along. When Puppy’s owner spotted him following behind she turned around and headed home, but on the way back the dog and his owner got separated. 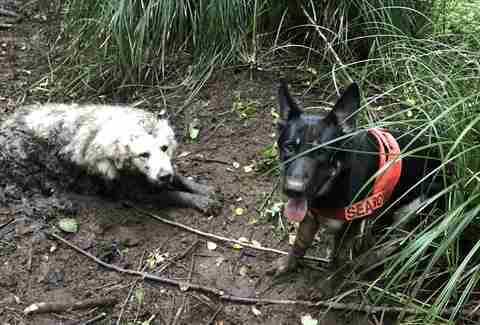 Volunteers searched the woods for the lost dog without luck. Alone in the darkness, Puppy couldn’t even hear his rescuers call his name. The Saturday morning after Puppy went missing, Tino and Branson met the lost dog’s owner in the woods to retrace her steps. 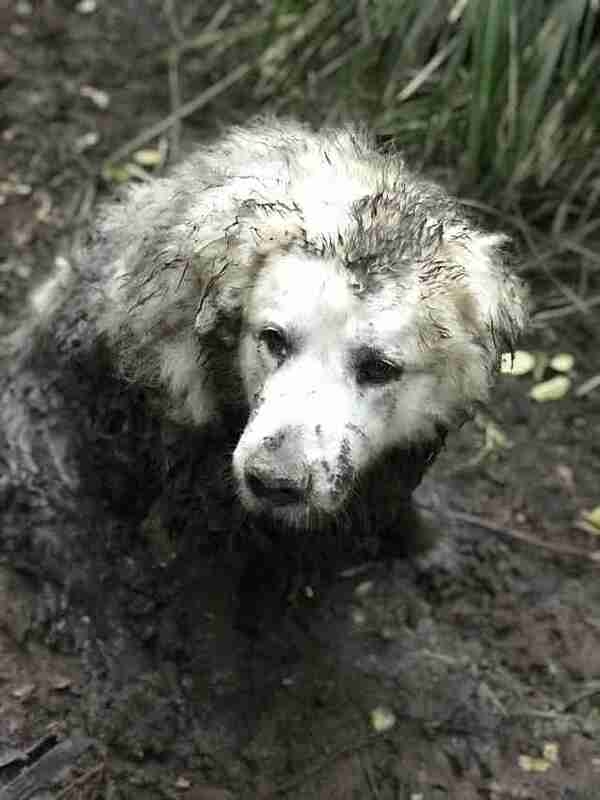 After 45 minutes of climbing over logs and weaving through trees, Tino led Branson and Puppy’s owner to a mud pit, and wouldn’t stop barking. At first, Branson wasn't sure what they were looking at — then something in the mud started whining. 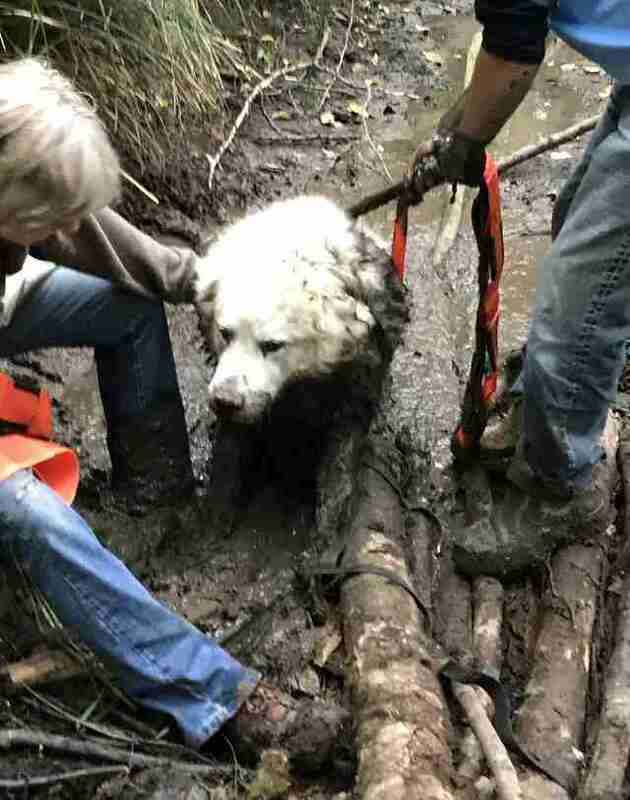 Branson laid branches over the mud so they could approach Puppy, and it became clear that all 150 pounds of dog would be difficult to extricate from the sticky pond. 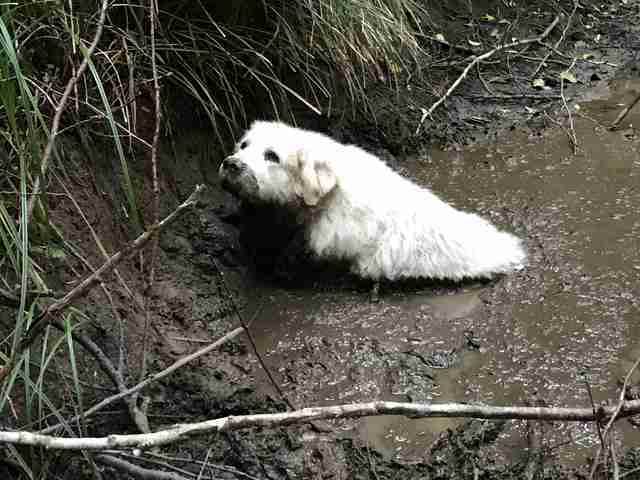 After being submerged in mud for over a day, Puppy had difficulty standing and rode home in an ATV trailer. Though he is much dirtier than when they last saw him, Puppy’s owners were overjoyed to have him back and grateful for Tino’s discerning nose. Just as Tino was saved as a young puppy, he is always happy to return the favor. There’s nothing that gets Tino more excited than going out for a search and helping lost pets get back home — and his dad couldn’t be more proud. To help other stray dogs like Tino find homes, you can make a donation to Useless Bay Sanctuary.